Read Reviews for Haiku here. 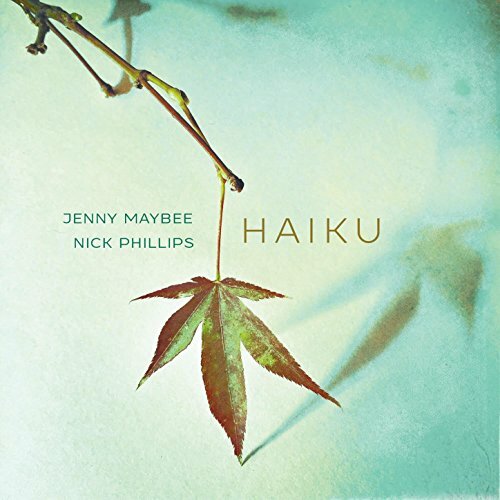 HAIKU—the premiere recording collaboration between multifaceted pianist/vocalist/songwriter/arranger Jenny Maybee and veteran jazz record producer/trumpet player/songwriter/arranger Nick Phillips—is a mesmerizing mix of vocal and instrumental jazz recordings in which refreshingly original compositions and imaginative arrangements of standards are brought to life with inspired, risk-taking, live-in-the-studio performances. The Maybee/Phillips musical partnership began with a chance meeting at the 2014 West Coast Songwriter’s conference. They discovered a shared love for music arising from a place of stillness conveying frequencies of appreciation and awe. Focusing their shared musical exploration on creating an environment for relaxed improvisation, the duo organically developed original compositions and reimagined favorite standards for the pure joy of making music together. Opportunity knocked when Cookie Marenco—an esteemed, audiophile engineer/producer with several GRAMMY® nominated recordings to her credit—approached Phillips about recording his next project at her legendary OTR Studios. Marenco’s proprietary Extended Sound Environment (E.S.E.) recording technique and state-of-the-art, ultra-high-resolution audio technology—Quad-rate DSD, aka DSD256, which records at a sampling frequency that’s 256 times that of a CD—captures Maybee and Phillips’ stirring and nuanced performances in a breath-taking sonic landscape that is at once warm and intimate, yet detailed and spacious. While the recording technology is leading edge, the approach was decidedly “old school”: Three musicians—Jenny Maybee (piano, vocals), Nick Phillips (trumpet), and Paul Eastburn (acoustic bass)—together in the studio for an afternoon. No headphones, no isolation between musicians, no overdubs, no Auto-Tune. Just real, responsive, in-the-moment jazz in complete, unedited takes. Although record producer Phillips is no stranger to working with jazz vocalists—having been at the helm of acclaimed jazz vocal projects including GRAMMY®-nominated albums by Karrin Allyson and Nnenna Freelon—Haiku marks his first album collaboration with a vocalist as a co-leader and recording artist. And while pianist Maybee has long been a fixture in envelope-pushing improvisation ensembles in the San Francisco Bay Area, Haiku marks the multi-talented artist’s long-overdue recording debut as a jazz vocalist. Released on January 29, 2016, the Haiku album release was launched with a celebration concert at Yoshi’s Oakland on February 1, 2016. Listen to excerpts from the album here.